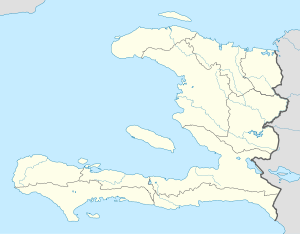 Cap-Haïtien (Haitian Creole: Kap Ayisyen; English: Cape Haitian) often referred to as Le Cap or Au Cap, is a commune of about 190,000 people on the north coast of Haiti and capital of the Department of Nord. 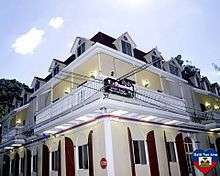 Previously named as Cap‑Français, Cap‑Henri and historically known as the Paris of the Antilles, displaying its wealth and sophistication through its beautiful architecture and artistic life. It was an important city during the colonial period, serving as the capital of the French Colony of Saint-Domingue from the city's formal foundation in 1711 until 1770 when the capital was moved to Port-au-Prince. After the Haitian Revolution, it became the capital of the Kingdom of Northern Haiti under King Henri Christophe until 1820. Cap-Haïtien's long history of independent thought and its relative distance from Port-au-Prince have contribute in making it a legendary incubator of anti-establishment movements. For instance, from February 5–29, 2004, the city was taken over by militants who opposed the rule of the Haïtian president Jean-Bertrand Aristide. They eventually created enough political pressure to force him out of office and the country. Cap-Haïtien is near the historic Haitian town of Milot, which lies 12 miles (19 km) to the southwest along a gravel road. Milot was Haiti's first capital under the self-proclaimed King Henri Christophe, who ascended to power in 1807, three years after Haiti had gained independence from France. He renamed Cap‑Français as Cap‑Henri. Milot is the site of his Sans-Souci Palace, wrecked by the 1842 earthquake. The Citadelle Laferrière, a massive stone fortress bristling with cannons, atop a nearby mountain is 5 miles (8.0 km) away. On clear days, its silhouette is visible from Cap‑Haïtien. The small Hugo Chavez International Airport (formerly Cap-Haïtien International Airport), located on the southeast edge of the city, is served by several small domestic airlines and has been patrolled by Chilean UN troops from the "O'Higgins Base" since the 2010 earthquake. The airport is currently being expanded. Several hundred UN personnel, including nearby units from Nepal and Uruguay, are assigned to the city as part of the ongoing United Nations Stabilization Mission in Haiti (MINUSTAH). The well-preserved Cathedral Notre-Dame of Cap‑Haïtien. Occupied for thousands of years by indigenous peoples, who had migrated from present-day Central and South America, the island was colonized in the 16th century by Spanish explorers. The Spaniards adopted the native name, Guárico for this area that is today known as "Cap‑Haïtien". Due to the chance introduction of new infectious diseases, as well as poor treatment of the indigenous peoples, their population rapidly declined. On the nearby coast Columbus founded his first community in the New World, the short-lived La Navidad. In 1975, researchers found near Cap‑Haïtien another of the first Spanish towns of Hispaniola: Puerto Real was founded in 1503. It was abandoned in 1578, and its ruins were discovered in the twentieth century. The French took over half of the island of Hispaniola from the Spanish in the early eighteenth century. They established large sugar cane plantations on the northern plains and imported tens of thousands of African slaves to work them. Cap‑Français became an important city of the French colonial period and the colony's main commercial centre. It served as the capital of the French colony of Saint-Domingue from its founding in 1711 until 1770, when the capital was moved to Port-au-Prince in the southwest part of the island. After the slave revolution, this was the first capital of the Kingdom of Northern Haiti under King Henri Christophe, when the nation was split apart. 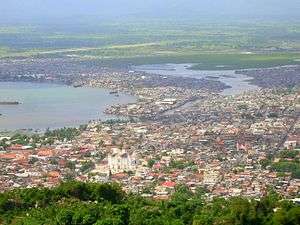 The central area of the city is between the Bay of Cap‑Haïtien to the east and nearby mountainsides to the west; these are increasingly dominated by flimsy urban slums. The streets are generally narrow and arranged in grids. As a legacy of the United States' occupation of Haiti from 1915 to 1934, Cap‑Haïtien's north-south streets were renamed as single letters (beginning with Rue A, a major avenue) and going to "Q" and its east-west streets with numbers from 1 to 26; the system is not followed outside the central city. The historic city has numerous markets, churches, and low-rise apartment buildings (of three–four storeys), constructed primarily before and during the U.S. occupation, with much of the infrastructure in need of repair. Many such buildings have balconies on the upper floors, which overlook the narrow streets below. With people eating outside on the balconies, there is an intimate communal atmosphere during dinner hours. Cap-Haïtien is known as the nation's largest center of historic monuments; it is a tourist destination. The calm water of the bay, picturesque Caribbean beaches and monuments have made it a resort and vacation destination for Haiti's upper classes, comparable to Pétionville. Cap‑Haïtien has also attracted more international tourists, as it has been isolated from the political instability in the south of the island. 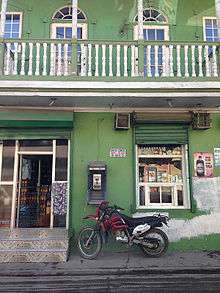 It has a wealth of French colonial architecture, which has been well preserved. During and after the Haitian Revolution, many craftsmen from Cap‑Haïtien, who were free people of color, fled to French-controlled New Orleans. As a result, the two cities share many similarities in styles of architecture. Especially notable are the gingerbread houses lining the city's older streets. 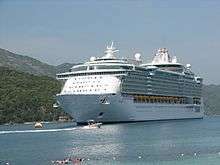 The walled Labadie (or Labadee) beach resort compound is located 6 miles (9.7 km) to the city's northwest, and serves as a brief stopover for Royal Caribbean International (RCI) cruise ships. Major RCI cruise ships, dock weekly at Labadie. It is a private resort leased by RCI, which had generated the largest proportion of tourist revenue to Haiti since 1986. It employs 300 locals, allows another 200 to sell their wares on the premises, and pays the Haitian government US$6 per tourist. 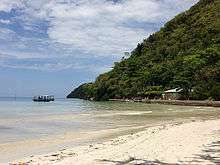 The resort is connected to Cap‑Haïtien by a mountainous recently paved road. RCI has built a pier at Labadie capable of servicing the luxury-class large ships, completed in late 2009. Attractions include a Haitian market, numerous beaches, watersports, a water-oriented playground, and a popular zip-line. People not on cruises can visit the beach too. Cormier Plage is another beach on the way to Labadie, and there are also water taxis from Labadie to other beaches, like Paradis beach. In addition, Belli Beach is a small sandy cove with boats and hotels. Labadie village could be visited from here. Vertières is the site of the Battle of Vertières, the last and defining battle of the Haitian Revolution. On November 18, 1803, the Haitian army led by Jean-Jacques Dessalines defeated a French colonial army led by the Comte de Rochambeau. The French withdrew their remaining 7,000 troops and in 1804, Dessalines' revolutionary government declared the independence of Haiti. In this last battle for independence, Capois La Mort survived all the French bullets that nearly killed him; his horse was killed under him, and his hat fell off, but he kept advancing on the French, yelling, "En avant!" (Go forward!) to his men. He has become renowned as a hero of the revolution and 18 November has been widely celebrated since then as a Day of Army and Victory in Haiti. 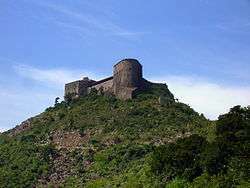 The Citadelle Laferrière, also known as Citadelle Henri Christophe, or the Citadelle, is a large mountaintop fortress located approximately 17 miles (27 km) south of the city of Cap‑Haïtien and 5 miles (8.0 km) beyond the town of Milot. It is the largest fortress in the Americas, and was listed by UNESCO as a World Heritage Site in 1982 along with the nearby Sans-Souci Palace. The Citadel was built by Henri Christophe, a leader during the Haitian slave rebellion and subsequently King of Northern Haiti, after the country gained its independence from France in 1804. Together with the remains of his Sans-Souci Palace, damaged in the 1842 earthquake, Citadelle Laferrière has been designated as a UNESCO World Heritage Site. Bois Caïman (Haitian Creole: Bwa Kayiman), 1.9 miles (3 km) south of road RN 1, is the place where Vodou rites were performed under a tree at the beginning of the slave revolution. For decades, maroons had been terrorizing slaveholders on the northern plains by poisoning their food and water. Makandal is the legendary (and perhaps historical) figure associated with the growing resistance movement. By the 1750s, he had organized the maroons, as well as many people enslaved on plantations, into a secret army. Makandal was murdered (or disappeared) in 1758, but the resistance movement grew. At Bwa Kayiman, a maroon leader named Dutty Boukman held the first mass antislavery meeting secretly on August 14, 1791. At this meeting, a Vodou ceremony was performed, and all those present swore to die rather than to endure the continuation of slavery on the island. Following the ritual led by Boukman and a mambo named Cécile Fatiman, the insurrection started on the night of August 22–23, 1791. Boukman was killed in an ambush soon after the revolution began. Jean-François was the next leader to follow Dutty Boukman in the uprising of the slaves, the Haitian equivalent of the storming of the Bastille in the French Revolution. Slaves burned the plantations and cane fields and massacred French colonists across the northern plains. Eventually the revolution led to the independence of Haiti. The site of Dutty Boukman's ceremony is marked by a ficus tree. Adjoining it is a colonial well, which is credited with mystic powers. Morne Rouge is 5.0 miles (8 km) to the south of Cap. It is the site of the sugar plantation known as "Habitation Le Normand de Mezy", known for several slaves who led the rebellion against the French. On 7 May 1842, an earthquake destroyed most of the city and other towns in the north of Haiti and the neighboring Dominican Republic. 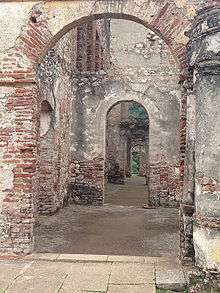 Among the buildings destroyed or significantly damaged was the Sans-Souci Palace. Ten thousand people died in the earthquake. Its magnitude is estimated as 8.1 on the Richter scale. In the wake of the 2010 Haiti earthquake, which destroyed port facilities in Port-au-Prince, the Port international du Cap-Haïtien was used to deliver relief supplies by ship. As the city's infrastructure was little damaged, numerous businessmen and many residents have moved here from Port-au-Prince. The airport is patrolled by Chilean UN troops since the 2010 earthquake, and several hundred UN personnel have been assigned to the city as part of the ongoing United Nations Stabilization Mission in Haiti (MINUSTAH). They are working on recovery throughout the island. After the earthquake, the port of Labadee was demolished and the pier enlarged and completely re-paved with concrete, which now allows larger cruise ships to dock, rather than tendering passengers to shore. Cap-Haïtien is served by the Hugo Chávez International Airport, Haiti's second busiest airport. It is a hub for Salsa d'Haiti. American Airlines has recently started international flights into the enlarged airport. The Port international du Cap-Haïtien is Cap-Haïtien's main seaport. The Route Nationale#1 connects Cap-Haïtien with the Haitian capital city Port-au-Prince via the cities of Saint-Marc and Gonaïves. 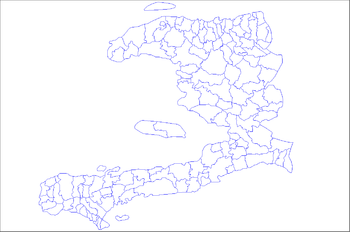 The Route Nationale#3 also connects Cap-Haïtien with Port-au-Prince via the Central Plateau and the cities of Mirebalais and Hinche. Cap-Haïtien has one of the best grid systems in Haiti with its north-south streets were renamed as single letters (beginning with Rue A, a major avenue), and its east-west streets with numbers. The Boulevard du Cap-Haitian (also called the Boulevard Carenage) is Cap‑Haïtien's main boulevard that runs along the Atlantic Ocean in the northern part of the city. Cap-Haïtien is served by tap tap and local taxis or motorcycles. A union of four Catholic Church private schools have been present for two decades in Cap‑Haïtien. They have higher-level grades, equivalent to the lycées that feed the Écoles Normale Supérieure in France. They have high standards of academic excellence, selectivity in admissions, and generally their students come from the social and economic elite. The new Universite Roi Henri Christophe is nearby in Limonade. 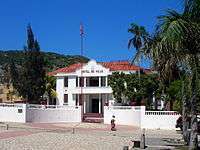 Hotel de Ville (City Hall), site of the City Council, Cap-Haïtien. A cruise ship at Labadie. ↑ Sister Cities International Archived September 21, 2008, at the Wayback Machine. 1 2 Knight, Franklin W.; Liss, Peggy K. (1991). Atlantic Port Cities: Economy, Culture, and Society in the Atlantic World, 1650–1850. p. 91. ↑ King, Stewart R. (2001). Blue Coat or Powdered Wig: Free People of Color in Pre‑revolutionary Saint Domingue. p. 23. ↑ Kuss, Malena (2007). Music in Latin America and the Caribbean: An Encyclopedic History. p. 254. ↑ Clammer, Paul; Grosberg, Michael; Porup, Jens (2008). Dominican Republic & Haiti. Country Guide Series. Lonely Planet. p. 331. ISBN 978-1-74104-292-4. ↑ Mackenzie, Charles (1830). Notes on Haiti: Made During a Residence in that Republic. 1. p. 152. ↑ Florida Museum of Natural History, Puerto Real. ↑ "Labadie". Expedia.com. Retrieved 2007-08-02. ↑ "Labadie". The Washington Post. 2007-01-21. Retrieved 2007-08-02. ↑ Prepetit, Claude (9 October 2008), "Tremblements de terre en Haïti, mythe ou réalité ?" (PDF), Le Matin, N° 33082 , quoting Moreau de Saint-Méry, Médéric Louis Élie, Description topographique, physique, civile, politique et historique de la partie française de l'Ile Saint Domingue and J. M. Jan, bishop of Cap-Haïtien (1972), Documentation religieuse, Éditions Henri Deschamps . "Archived copy". Archived from the original on 2011-12-21. Retrieved 2011-09-28. ↑ "Haiti renames airport for Hugo Chavez". The Big Story. Archived from the original on 15 July 2015. Retrieved 6 June 2015. ↑ Index of / Archived February 17, 2015, at the Wayback Machine. ↑ Radio Gamma fm, 99.7 Mhz - Bienvenue Archived December 4, 2008, at the Wayback Machine. ↑ Archived January 16, 2014, at the Wayback Machine. ↑ Archived January 25, 2014, at the Wayback Machine. Dubois, Laurent Haiti : the aftershocks of history. New York : Metropolitan Books, 2012. Popkin, Jeremy D. Facing racial revolution : eyewitness accounts of the Haitian Insurrection Chicago : University of Chicago Press, 2007. Alyssa Goldstein Sepinwall. Haitian history : new perspectives. New York : Routledge, 2012. Wikimedia Commons has media related to Cap-Haitien. The Louverture Project: Cap Haïtien - Article from Haitian history wiki. Sante's page on Cap-Haitien. Konbit Sante is a non-denominational mixed NGO.